This text is designed for the single variable component of a three-semester or four-quarter calculus course (math, engineering, and science majors). Calculus hasn't changed, but your students have. Today's students have been raised on immediacy and the desire for relevance, and they come to calculus with varied mathematical backgrounds. 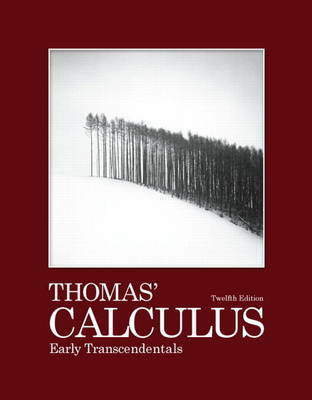 Thomas' Calculus: Early Transcendentals, Twelfth Edition, helps your students successfully generalize and apply the key ideas of calculus through clear and precise explanations, clean design, thoughtfully chosen examples, and superior exercise sets. Thomas offers the right mix of basic, conceptual, and challenging exercises, along with meaningful applications. This significant revision features more examples, more mid-level exercises, more figures, and improved conceptual flow. This is the full version of the text contains Chapters 1-16. ISBN-10:0321628837 | ISBN-13:9780321628831 Thomas Calculus Early Transcendentals, Single Variable) contains Chapters 1-11. The Multivariable version of the text contains Chapters 11-16. MyMathLab access is not included with this ISBN.